For all practical purposes, the (Jewish) race is today, as Josephus boasted it was in his time, a unit, and it is somehow very ably directed in its predatory operations against other races… The great mass of Jews seem to be, almost without exception, under the tight control and discipline of their fairly numerous leaders, who could, in turn, be equally subject to the orders of a supreme and secret directorate, which plans and directs a conscious strategy as set forth in the famous “Protocols.”…. I have come to the conclusion that Jews are the world’s “controllers” independently, thrice, in three separate empirical investigations. I am not predisposed to this conclusion through racial or religious prejudice. In fact, I am saddened and surprised by this conclusion. But an honest researcher must follow the truth wherever it leads. In the first case, my research into the origins of 9/11 produced overwhelming evidence that 9/11 was one in a long series of false-flag, synthetic terror attacks that were orchestrated and covered up at least, in large part, by “International Jewry,” aka the “shadow government” (see Fuerza’s Masters of Deception; Zionism, 9/11, and the War on Terror Hoax, 2013 and my website, www.911nwo.com). Secondly, this investigation into the New Age/New World Religion leads me again to identify the same perpetrators (“perpeTRAITORS”). Thirdly, my investigations into global organized gang stalking (gangstalkingmindcontrolcults.com points to the same perpetraitors. 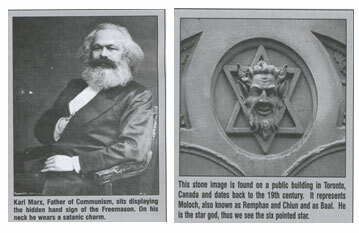 Who is the common enemy of the Jews? 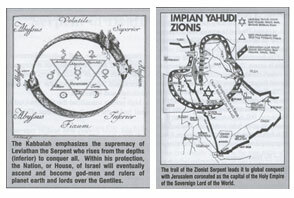 All non-Jews….aka gentiles, heathens, infidels, “goyim” (human cattle), and beasts. 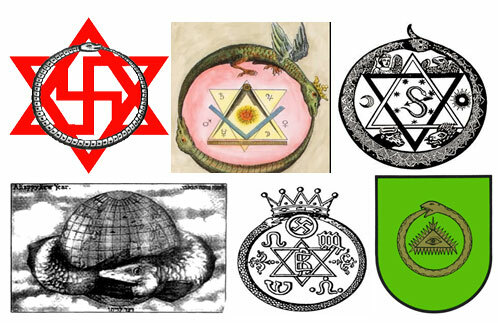 Jews have historically worked to overthrow the established governments of the nations they inhabit through their control of finance, the media, and other sectors of society, and by employing countless gentile fronts and covert webs of influence, including most secret societies. They have not always succeeded. Indeed, since 250 AD, Jews have been expelled from at least 78 (probably more) different countries on over 100 different occasions (Figure 1; Hitchcock, 2005). 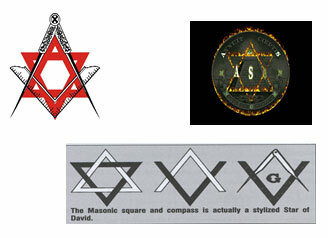 13) Wars are the Jew’s harvests. 20) The Jews of America are for you (Israeli terrorists). You are their champions…. Every time you blow up a British arsenal, or wreck a British railroad train sky high, or rob a British bank, or let go with your guns and bombs at the British betrayers and invaders of your homeland, the Jews of America make a holiday in their hearts. The (Levite) sect which attached itself to and mastered the tribe of Judah took the rising concept of one-God of all-peoples and embodied it in its Scripture only to destroy it, and to set up the creed based on its denial. It is denied subtly, but with scorn, and as the creed is based on the theory of the master race this denial is necessary and inevitable. A master-race, if there be one, must itself be God.The creed which was given force of daily law in Judah in 458 BC was then and still is unique in the world. It rested on the assertion, attributed to the tribal deity (Jehovah), that the “Israelites” (in fact, the Judahites) were his “chosen people” who, if they did all his “statutes and judgments,” would be set over all other peoples and be established in a “promised land.” Out of this theory, whether by forethought or unforeseen necessity, grew the pendent theories of “captivity” and “destruction.” If Jehovah were to be worshipped, as he demanded, at a certain place in a specified land, all his worshippers had to live there. The Zohar (Hebrew: זֹהַר, lit Splendor or Radiance) is the foundational work in the literature of Jewish mystical thought known as Kabbalah. 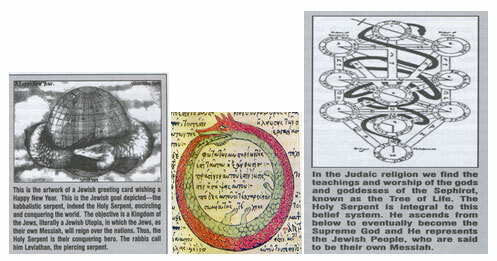 It is a group of books including commentary on the mystical aspects of the Torah (the five books of Moses) and scriptural interpretations as well as material on Mysticism, mythical cosmogony, and mystical psychology. 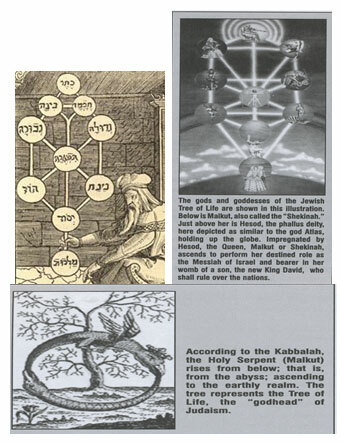 The Zohar contains a discussion of the nature of God, the origin and structure of the universe, the nature of souls, redemption, the relationship of Ego to Darkness and "true self" to "The Light of God," and the relationship between the "universal energy" and man. Its scriptural exegesis can be considered an esoteric form of the Rabbinic literature known as Midrash, which elaborates on the Torah. 2) On Purim, Feb. 25, 1994, Israeli army officer Baruch Goldstein, an orthodox Jew from Brooklyn, massacred 40 Palestinian civilians, including children, while they knelt in prayer in a mosque. 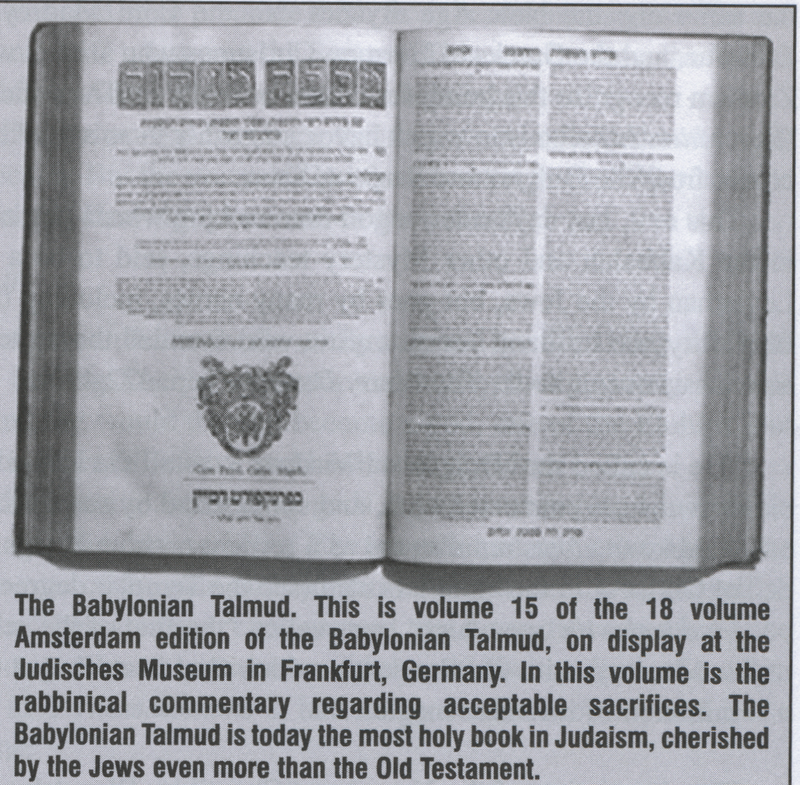 Goldstein was a disciple of the late Brooklyn Rabbi Meir Kahane, who told CBS News that his teaching that Arabs are "dogs" is derived "from the Talmud." (CBS 60 Minutes, "Kahane"). 3) University of Jerusalem Prof. Ehud Sprinzak described Kahane and Goldstein’s philosophy: "They believe it’s God’s will that they commit violence against goyim, a Hebrew term for non-Jews." (NY Daily News, Feb. 26, 1994, p. 5).